The Jefferson Arena . . . The Beginning . . . The New Arena . . . Just what I expected. It was with great anticipation that I pulled into the parking lot in front of Jefferson High School. Like many of my friends and Jefferson citizens I was attending the dedication of the new Jefferson in-door athletic facility. It had been advertised as "The Arena" in the local newspaper and even had this posted on the front of the building. It was easily viewed as you raised your eye's skyward to gaze upon the elegant facility that was absolutely breath-taking when viewing it from the outside. I knew that after the ribbon-cutting and outside festivities were concluded, I was about to see something monumental. There was no doubt in my mind that the inside of that building would probably leave me breathless. I was not surprised when I first cast my eyes on the inside of The Arena. It was probably even a little bit more extravagant than even I had imagined it could possibly be. The red and blue was also expected. It was a spectacle of color and splendor that had to make the true Jefferson High School supporter and fan tingle with pride. I can only imagine the feel as our Dragon athletes prepare to play their first volleyball, basketball, or wrestling games or events in The Arena. To my understanding the first sporting event to be held in the new facility will be a volleyball game in mid-August, I want to go on record as predicting that it will be one of the most attended in-door events in the history of Jefferson High School. Everyone will want to see that first event in the new venue. It'll be that way for basketball and wrestling when these Dragon teams finally take to the floor during their respective season openers. I think one thing I have learned over the years is that this board of education, chaired by Ronnie Hopkins, doesn't jump into major projects in a small way. 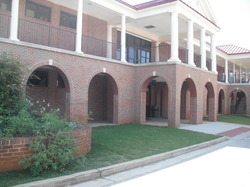 Most of their projects over the last 10 to 15 years have been spectacular additions to the school. I expect that quest for mind-boggling, but much needed, additions to our old school house will continue as long as this board is seated. And that bodes well for the future of our Jefferson youth as they will have the opportunity to attend one of the finest facilities in the state. As I left the new Jefferson Arena, I turned back for a last view, sort of shook my head at what I had just witnessed and thought back to my days at small town, class B Jefferson High School. Never in my wildest dreams did I ever foresee us becoming a Class AAA school with probably the finest Football stadium, track and field facilities and now one of the most beautiful in-door athletic facilities in the state of Georgia. Progress has indeed been good to Jefferson City Schools over the years. Sunday, March 8 was a beautiful day in Jefferson, Georgia. It was even more beautiful for the 700-800 Jefferson fans and supporters that came by to welcome the new Jefferson Arena into the Dragon hierarchy. U. S. Representative Doug Collins high-lited the presentation program as a ribbon-cutting and formal dedication ceremony was emceed by Board Of Education Chairman Ron Hopkins. It was a glorious day to be a Jefferson Dragon, as one of the finest athletic facilities in the state, and maybe the nation, was shown off to the people of Jefferson. The new arena is the third and final project covered under a $25 million bond approved by Jefferson voters in 2011 and replaces a gymnasium that had been in use since 1951. "Hopkins stated, " We will continue to use that facility for PE and other events, and it will always be know as the Jefferson High School Community Gymnasium. He continued, "And this building will be known as the Arena at Jefferson High School. The first athletic event in the Jefferson Arena involving Jefferson teams is expected to be when the Jefferson volleyball team plays its home opener on August 13, 2015. The Arena at Jefferson High School stands ready to start a new era of excellence for Jefferson indoor sports, The building has 140,000 blocks and 300,000 bricks in its structure. Past the main High School entrance and on to the new Jefferson Arena. Dr. John Jackson cut the ribbon to officially open The Arena dedication ceremony. 700 to 800 Jefferson fans/supporters make their way into The Arena. The concession area awaits that first Dragon opening date. 2,068 seats will make viewing a game or wrestling match an enjoyable event. All Chair-back seats. Participants prepare for opening dedication ceremony. Honoree's stand as the ceremony concludes. A beautiful floor , , , A 600 ft. Walking Track surrounds the floor. The basketball court is 50' by 94 '. The volleyball court is 30' X 60'. One of four scoreboards in The Arena. There are also 14 TV monitors. Wrestling Coach Doug Thurmond finally has a facility befitting of his 15 straight State championships. Another scoreboard at the entrance of the boys locker room. Another view of the locker-room entrance scoreboard. Lockers in the boys locker room. There are 237 lockers in the facility. Beautiful artwork at the center of the basketball court. Dragon artwork abounds in the wrestling room. The wrestling room has 5,256 square ft. More art work. Room, room and more room in the wrestling room. The 6,506 Square ft. weight room is a sight to behold. Strength should not be a problem for future Dragon athletes. Color coded weights by poundage. Building strength and power in all sports. The facility has seven offices and two class rooms. First class all the way! There are 5 trophy cases in the facility. Dragon fans came, saw and left. You can bet they'll all be back!